WebCube is a “Web screen security solution” which protects enterprise confidential and content expressed in web browser from illegal leakage. WebCube secures the screen in Internet explore, Chrome, Firefox, Opera, Safari and etc. 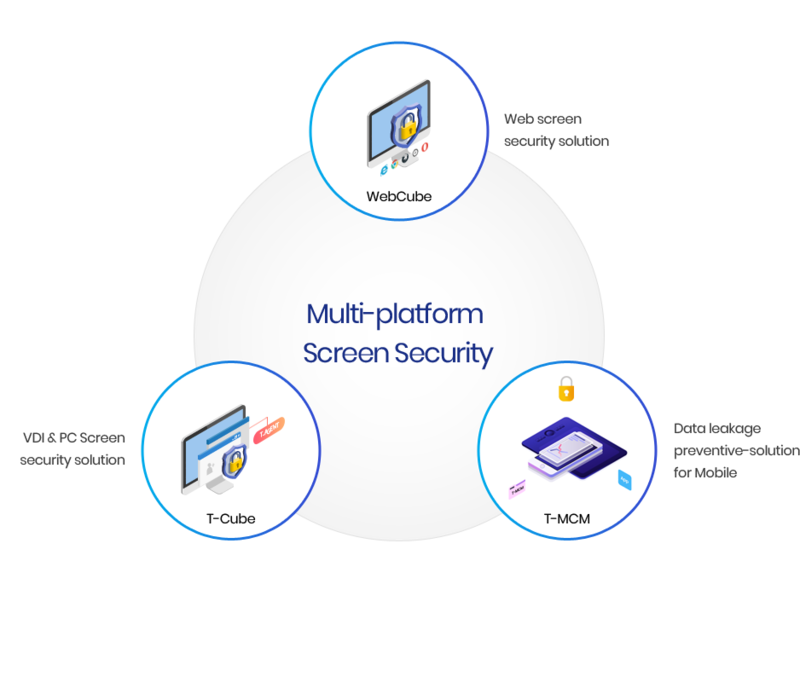 T-Cube is “VDI & PC screen security solution” which prevents the confidential information and contents leakage, exposed through screen in VDI & PC. Linking not only with VMWare, Citrix, and MS Hyper-V which are reprehensive VDI solution but also with cloud service, T-Cube protects the data. T-MCM is the “data leakage preventive-solution for mobile” only to prevent the illegal leakage of various types of data and contents provided by the mobile device. And it can easily interlock with other application because it is provided a module.